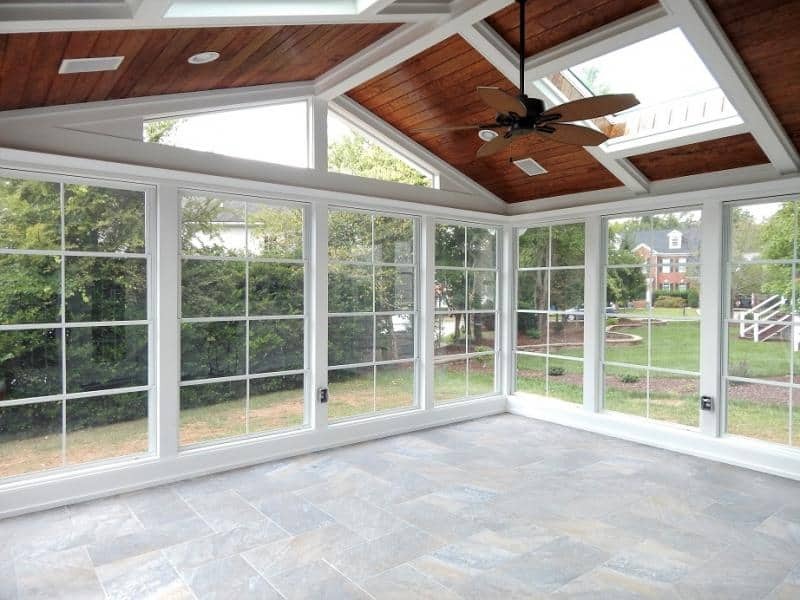 The ceiling is the focal point of the screen porch! 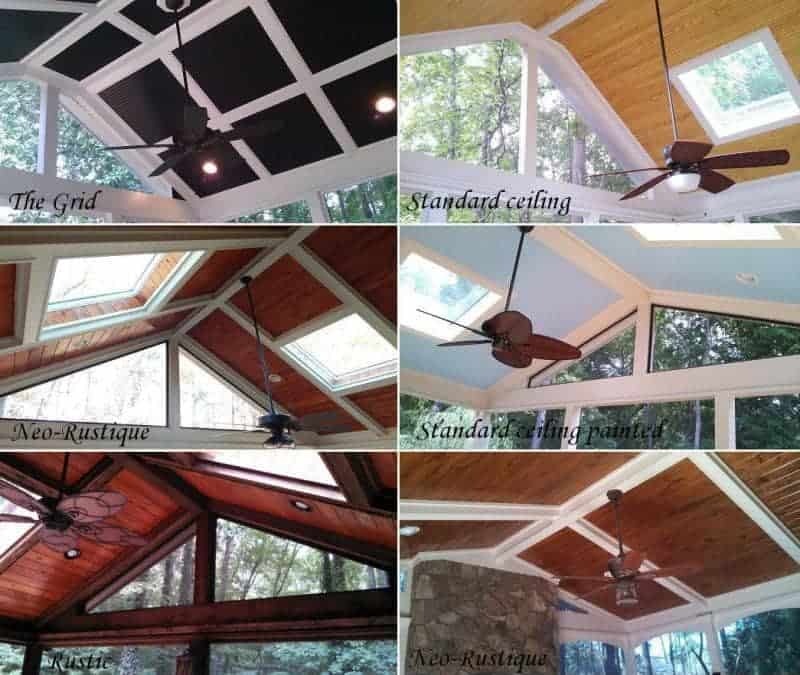 And – yes, any of these ceiling styles are included in your porch addition! 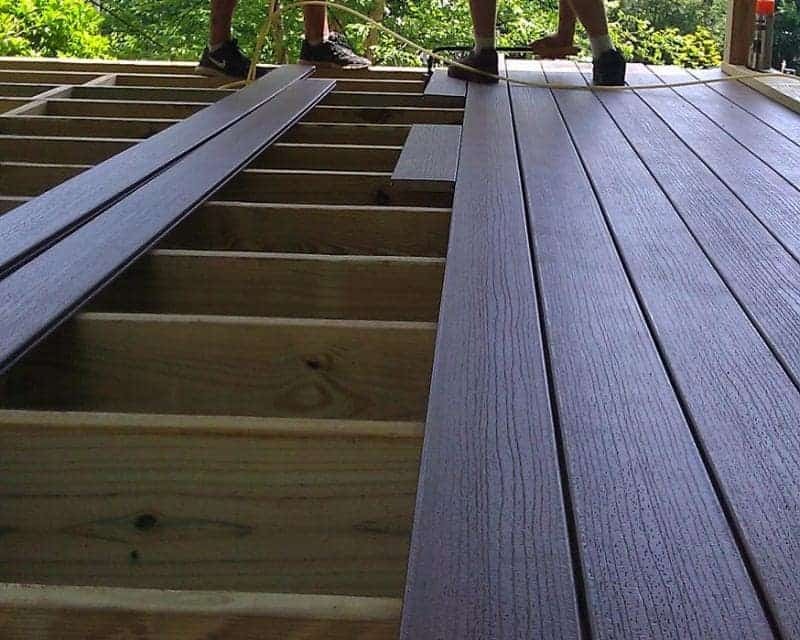 You are looking at hand picked, tongue and groove boards, not paneling. Choose any one of these designs, in any color for your project! This is the biggest way to personalize your porch. 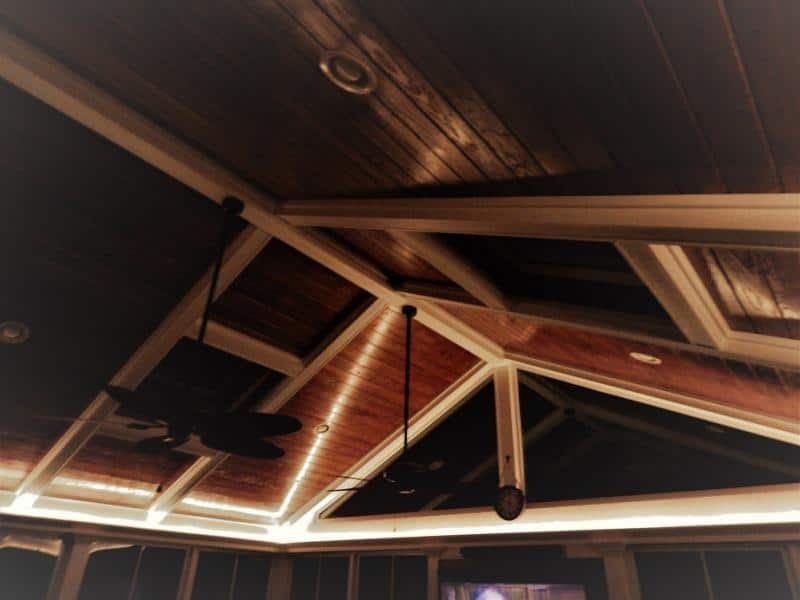 (Skylights additional) See our Ceiling Page for more examples. 4 Can lights on a dimmer switch are included for adjustable lighting. Ceiling fan is wired and installed by us (actual fan provided by homeowner). These large posts add strength visually and structurally. 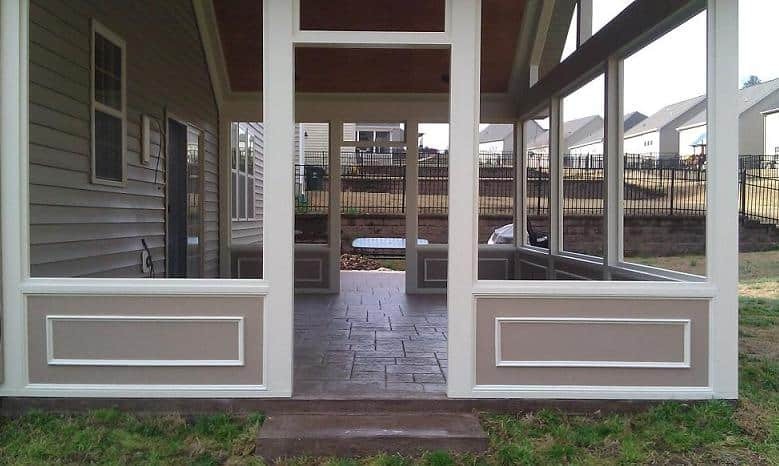 On screen porches, they have a column type effect. We have a professional workshop where we custom make every screen panel. Separate panels make it easy to pop one out and replace. This is great for homeowners who may need to replace screen in the future. The great thing is that I’ve not had one call back in over 300 projects due to damaged screen. That’s due to the Super-screen(TM) we use! A Kevlar-type screen that is ex-screen-ly durable! On 3 season rooms, we use a very sleek, iron railing with a much more narrow top and bottom rail for better view. It actually saves 7 inches of horizontal view total, which is alot! Especially considering that the top rail lines up with your line of sight while sitting. Electrical outlets are included in our base package. Extra crown moulding at top of porch support posts. This option was added to our normal base package because it’s been a huge hit. I offered it as an option but everyone wanted it, so now it’s part of our base package! 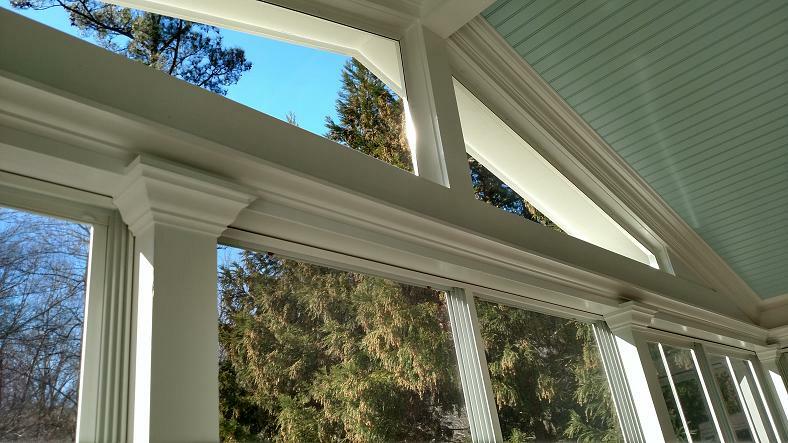 A small detail that adds greatly to the architecture when placed beside our already detailed trim outs. I love this look! 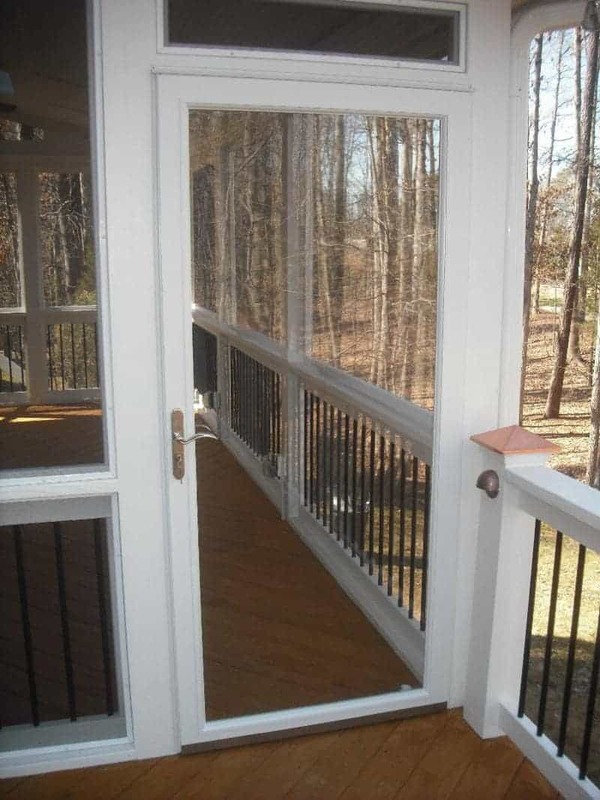 We provide a full view (screened) storm door for every screen porch. It latches shut, preventing that slapping that screen doors do when it’s windy outside. It comes with two automatic closers, top and bottom for a perfect close every time. These doors also have an adjustable kick plate sweep and a lock & key. On 3 Season Rooms we use a storm door with an operable window for more ventilation. 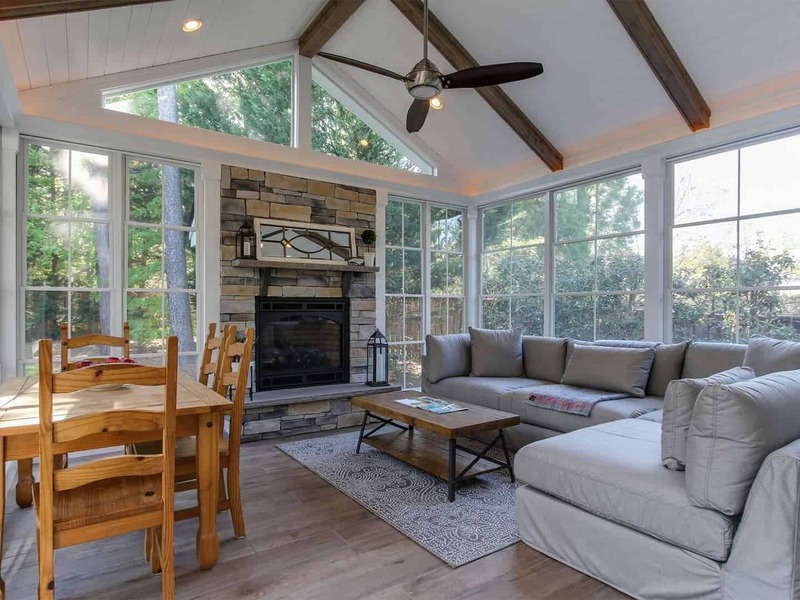 Are you worried about losing light by adding a roof to your house? 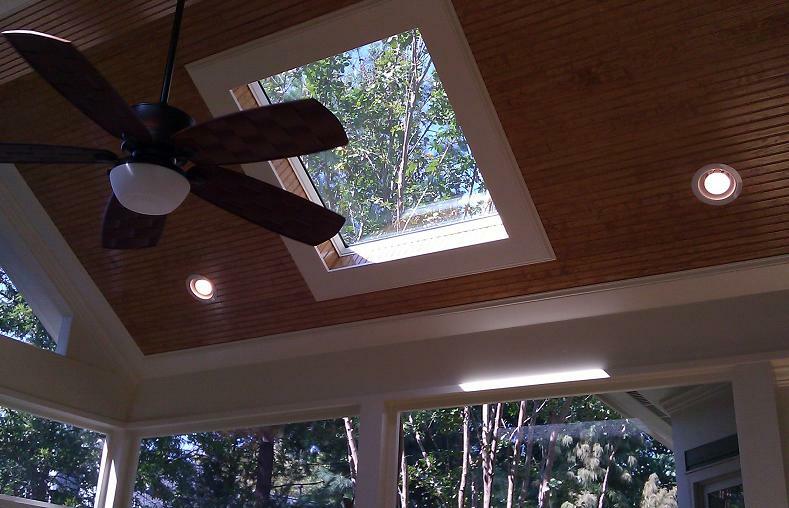 Skylights may be your answer! Available in sizes of 2′ x 4′ (left) or 4’ x 4’ (right)! Each skylight is trimmed out with tongue and groove, to match the ceiling, and then picture framed with trim. Eze Breeze panels are awesome! They keep wind, rain and pollen out, hold in heat, hamper down outside noises considerably and more. 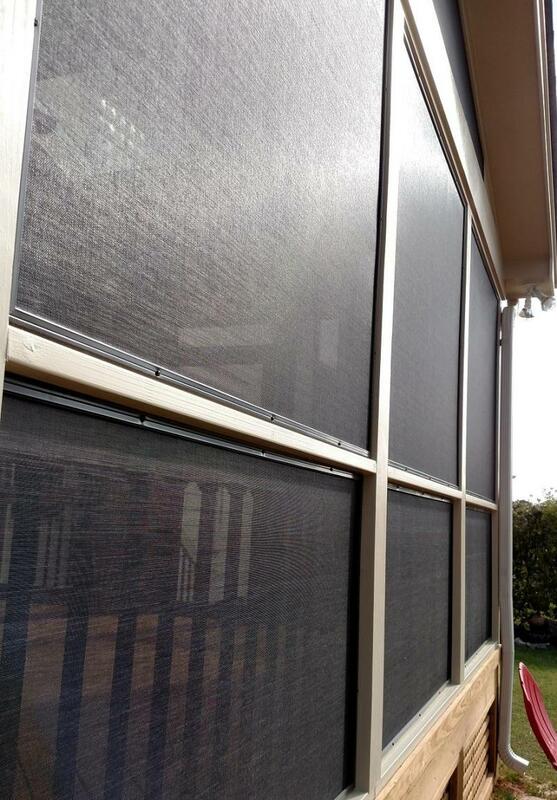 In a few minutes, convert your 3 season room to a screen porch and back again with Eze Breeze panels! 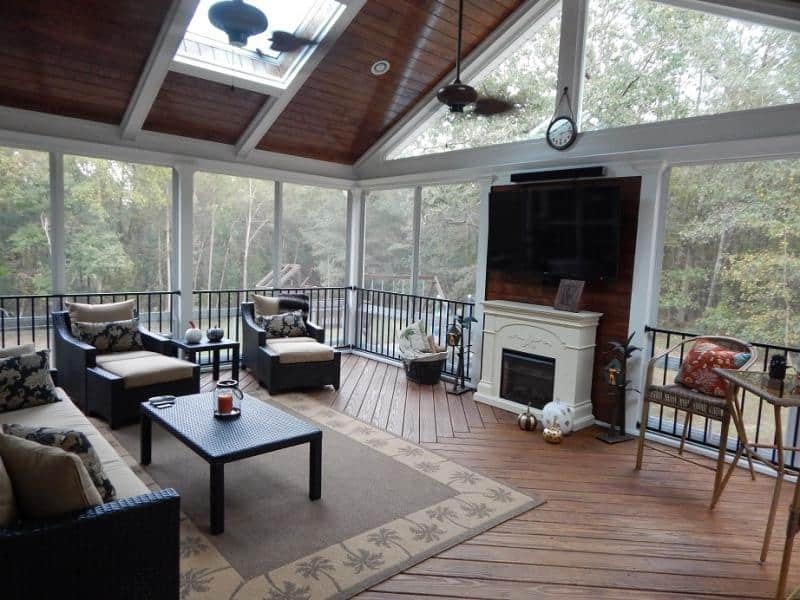 With integrated screen on the outside, all you have to do is raise or lower the retractable sections to have a screen porch or 3 season room almost instantly. 90% of the projects we build, are Eze Breeze projects. They’re a great value being much more affordable than full windows and adding much more usage to the room! Our Eze Breeze rooms are called 3 Season rooms but can actually extend your time of use to more than just 3 seasons. 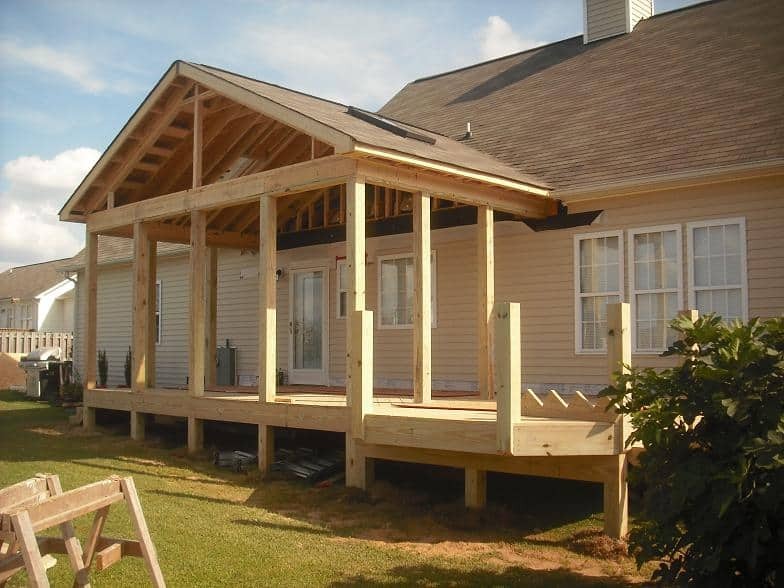 We can build open decks as an accessory to your screen porch or 3 season room. 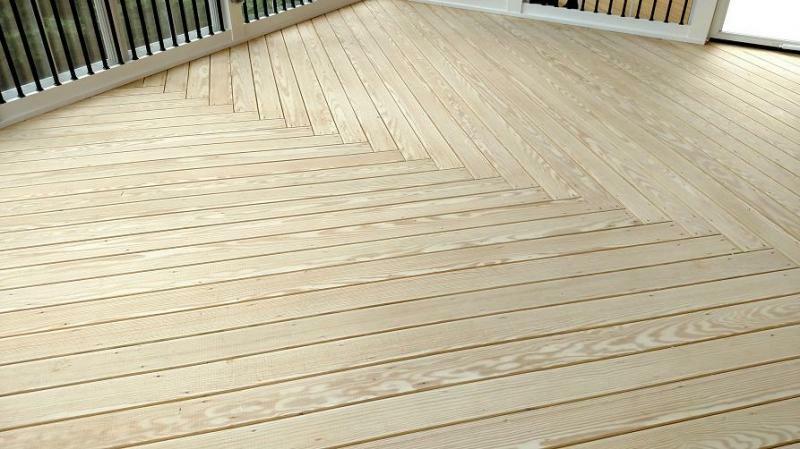 We suggest going with composite decking on these as they would be susceptible to heavy rain and sun exposure. 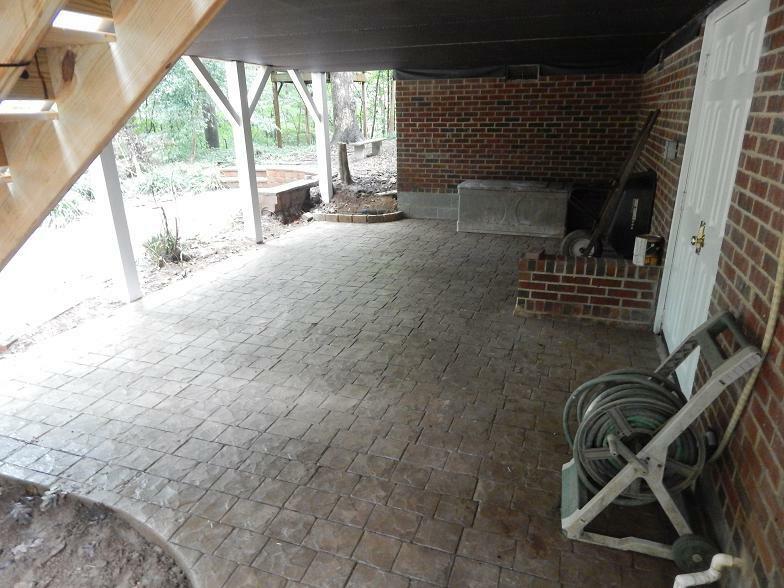 We can install custom designed, dry-laid patios with fire pits and stone sitting walls as an accessory to your screen porch or 3 season room. Many material options and designs available. You can use your 3 season room in the fall and wintertime with a fireplace to keep you warm. We can do gas (middle and right) or wood burning (left). The gas fireplace is a very nice unit with blower and remote. The wood burning has an option for an log igniter (bottom middle) to make a quick and easy fire. Sure beats rubbing two sticks together! This option offers great versatility. 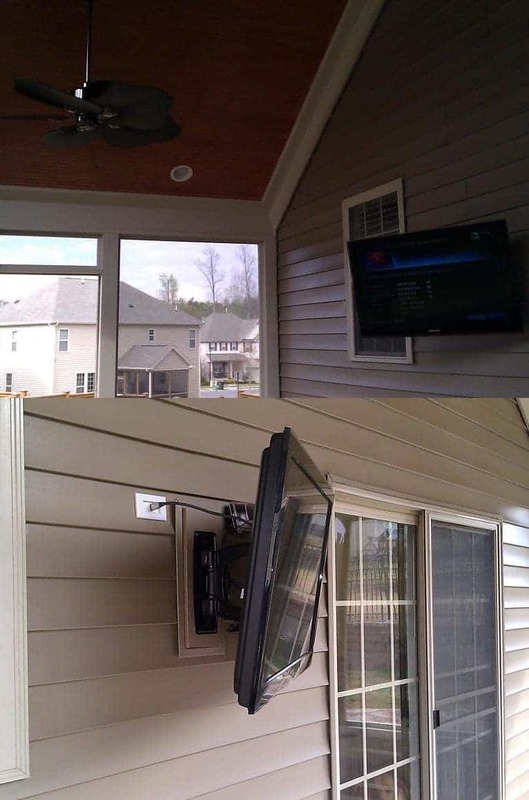 Here we built a privacy wall that serves as a place for a t.v. and fireplace heater. The fireplace shown is actually a heater that plugs into any regular outlet. 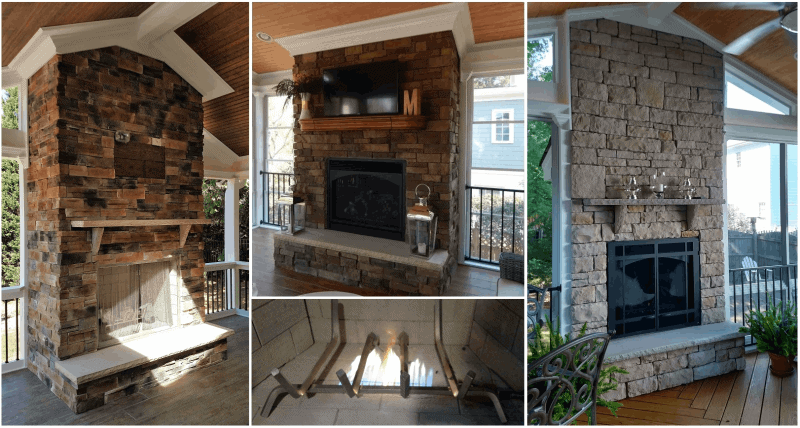 It was purchased online, will heat 400 square feet and is a low cost alternative to a stone fireplace. 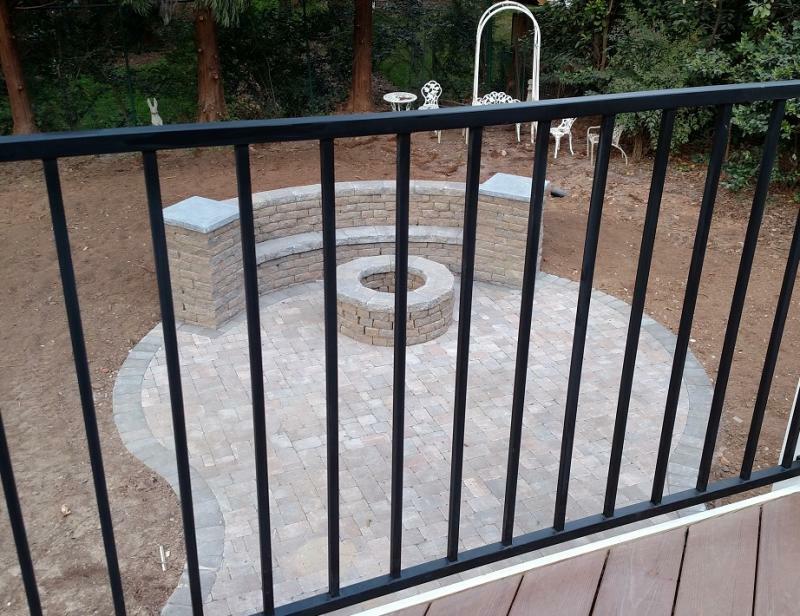 This option is also great for getting a little more privacy if you have close neighbors. In this orientation, it allows you to watch t.v. and still be facing the backyard view! We love tile on 3 season rooms! 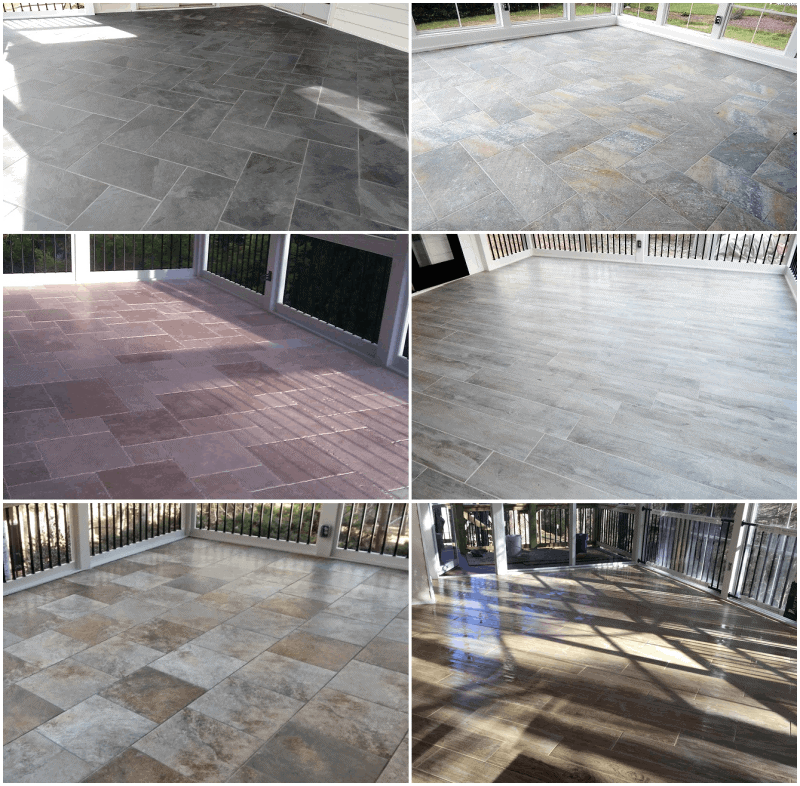 We can install the tile of your choosing. The ceiling is still the focal point, but a tile floor can double the wow factor! 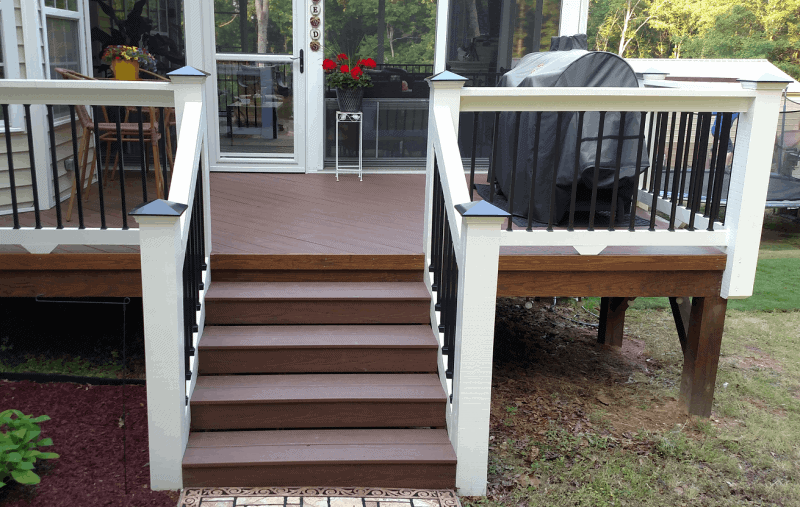 This option takes full advantage of the space under the porch. Being a dry space it can be used as a work area or an additional lounging area! 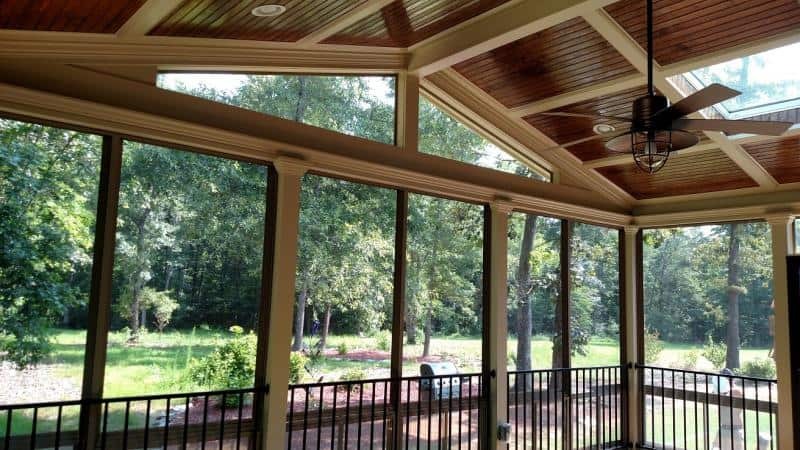 If you build a screen porch or 3 season room that is 6′ or higher above grade level, this is an option for you! 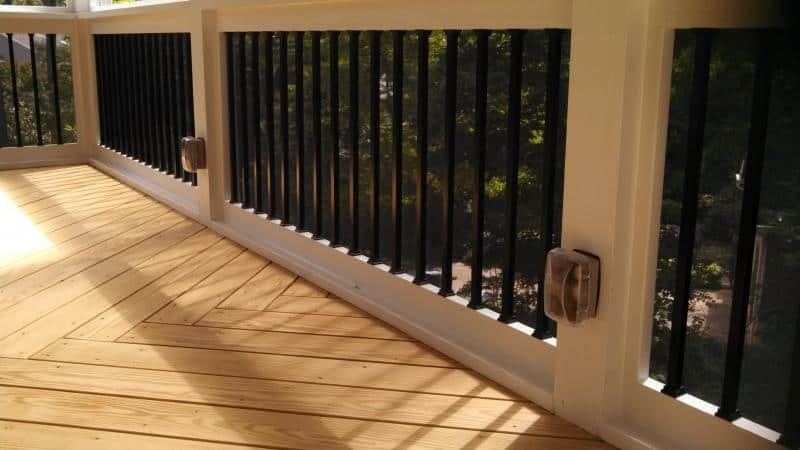 Add as many electrical outlets as you like on our porches! We can conceal cable and electrical hook-ups behind your T.V. (T.V. not included)! Bonus points if you can find the dog! 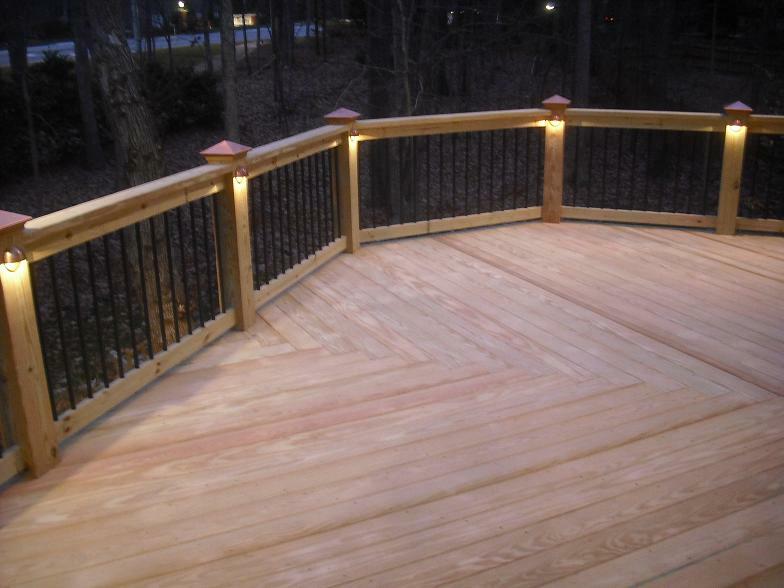 We can install low-voltage lighting on your grilling deck. 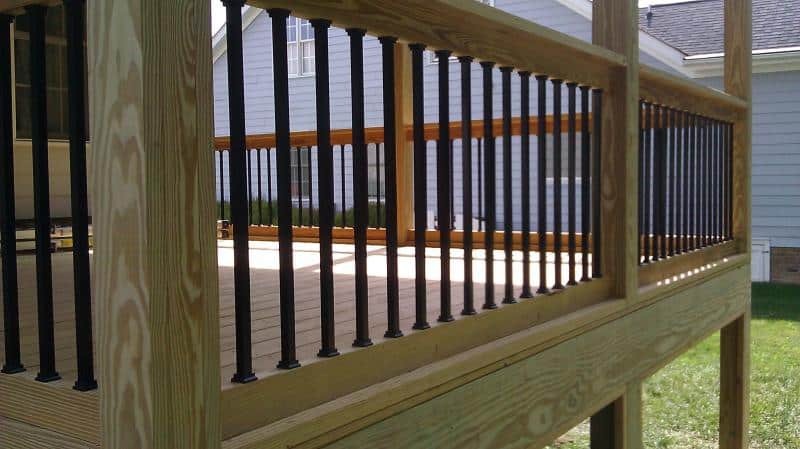 The wiring is concealed throughout the railing and operated by a switch inside the house. 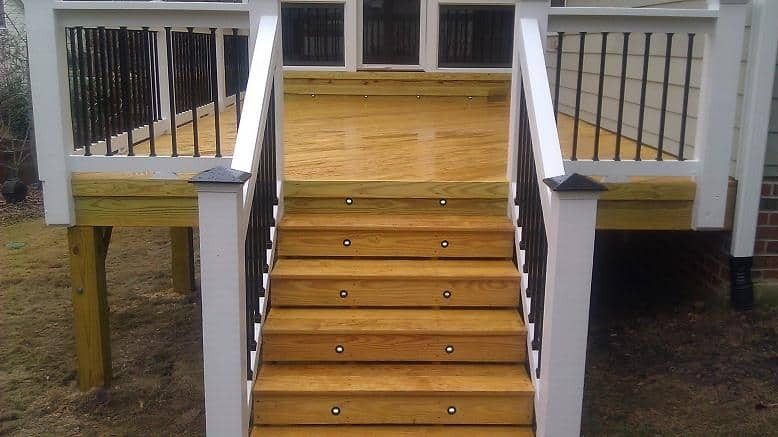 You can’t miss the steps with lighting like this!